Over the last twenty years or so, Calahonda has become, in some peoples opinion a town in its own right although the local authorities refuse to give it this status. It is a hugely popular area for both British holiday makers and tourists alike. Calahonda is less than a half hour from Malaga airport in between Fuengirola and the east side of Marbella. Made up mostly of villas and townhouses with very few high rise apartment buildings Calahonda encompasses both rural and coastal life. All amenities are within a few minutes including restaurants, bars, supermarkets, shops, banks, schools, sports facilities, pretty much everything you would expect in a town of this size. 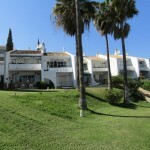 There are four golf courses within the area of Calahonda and the Costa del Sol hospital is less than five minutes away.